Happy weekend and so glad it’s finally here! Been a little hectic at work and being on call this week, so it did seem to fly by. Skipper is still loving his hammock bed and I desperately need to vacuum it after barely a week of using it because he’s shedding so much now. Here hubby caught a cute pic of one of his ears stuck up as he was listening for someone at the door. 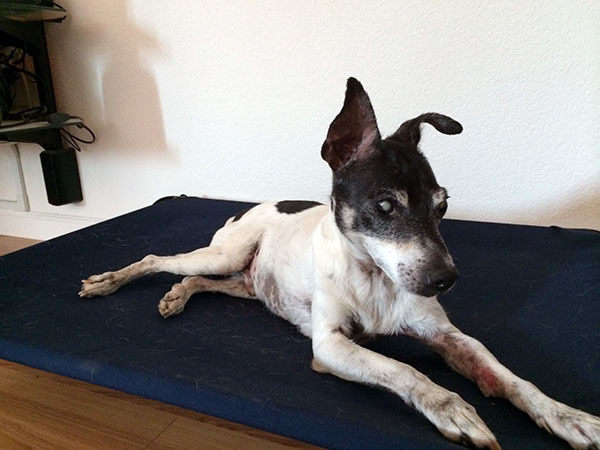 His leg wound is starting to heal, but he still spends a lot of time licking and agitating it. We’ve given up on trying to bandage it because he chews them off during the night and seems to make a bigger mess of the wound in the process. Unfortunately his canine diabetes is complicating the healing process and we may need to take him to the vet soon if there’s not much progress. 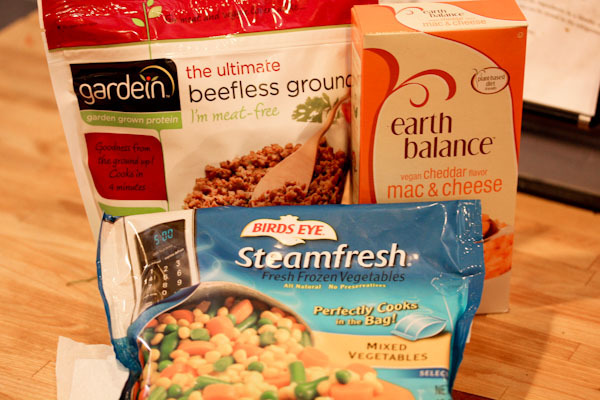 I have a new banner for V-Dog vegan dog food on this site and I’m happy to support them! And Miko was happy to chow down on his bowl of V-Dog this morning. I also love that their a local business here in Sacramento and have been lucky enough to meet and see the owner at a few local festivals and events, such a great cause. 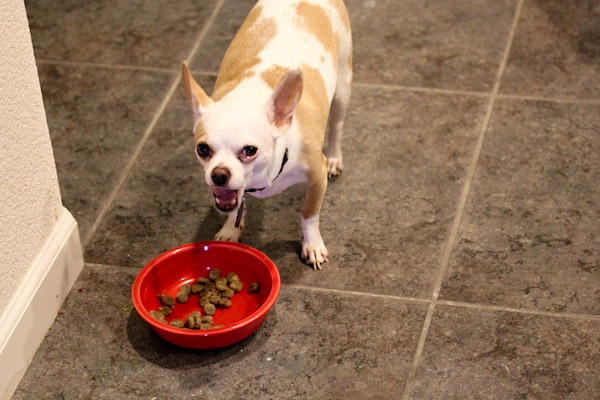 It wasn’t easy to convert the chihuahuas to eating dried food, they tend to be more picky with their tiny mouths. But adding a little warm water or veggie broth to soften it helps a lot. 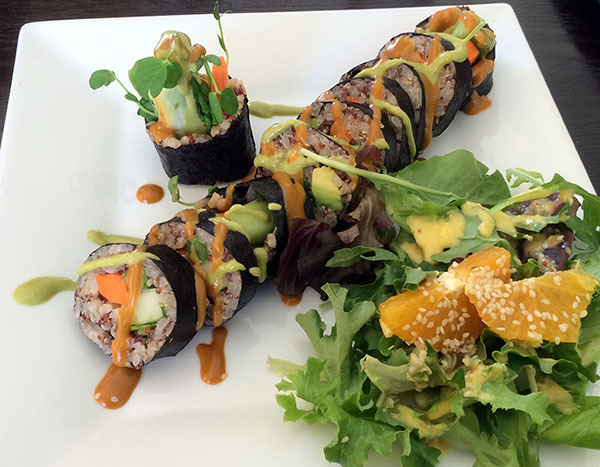 I had an amazing dish at Baagan this week, brown rice veggie sushi with zesty ginger sauces, sprouts, asparagus, and avocado. They nailed the art of sushi rolling, something I have yet to do! And the hearty brown rice texture was great, a fun change to traditional sushi rice. Hubby also had a little fun this week creating a vegan chili mac. 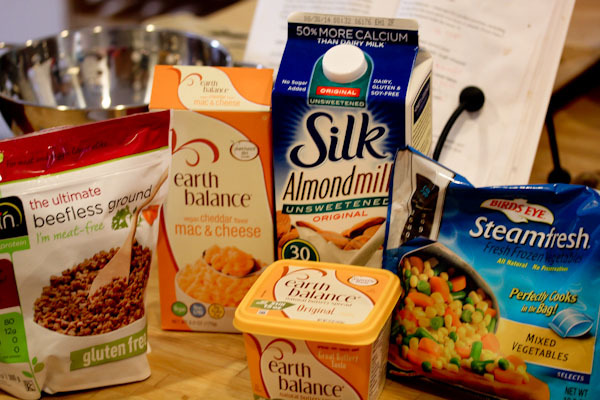 While I was at Whole Foods last week, I came across the elusive Earth Balance vegan boxed mac & cheese and had to pick up a box for hubby since he’s always been a fan of the boxed stuff. 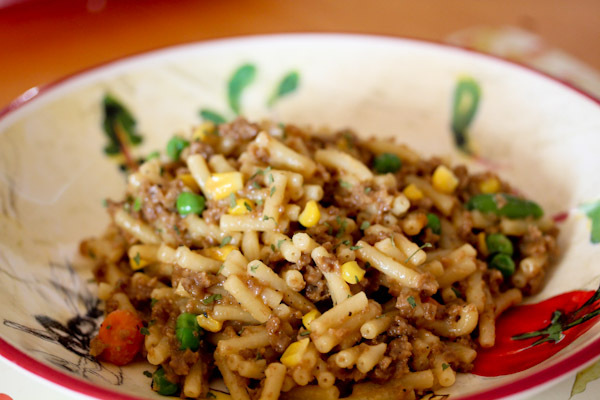 He got creative with Gardein Beefless Ground and steamed veggies to create a one-pot meal. And it was an impressive creation. I sampled it and it was very good and hearty. But truthfully I’m not a huge fan of boxed mac & cheese, it’s not a comfort food for me and I made a big old salad for dinner with tofu and balsamic vinegar instead. But I do love that hubby and I can play dueling chefs in the kitchen making what we like and not feeling like we have to eat the same things together every night. When I first went vegan, a lot of people questioned me on that wondering how it would affect our relationship and I wondered why that was such a big deal. When couples and families go out and order take out, they always order different things. Making different dishes at home is the same, just healthier and cheaper than going out every night. People, particularly adults, should have freedom to follow their own dietary path and enjoy getting creative in the kitchen. I’m still using our standing desk from The UpStanding Desk and liking it. The first few days were a bit of an adjustment, it did feel weird at first. But after nearly two weeks I hardly notice it. Hubby joked that it’s like being at an old school standing arcade game when he’s playing games on it and that’s fun! I was a little worried about the mornings because I have a habit of checking news and surfing the internet on it when I’m sipping coffee and waking up and maybe standing wouldn’t be great for that, but it hasn’t been a problem and feels good to stretch and warm up my legs while reading. Thank you, veggie sushi can be very satisfying and it’s great seeing more restaurants getting creative with plant-based sushi. I thought I commented on this one but maybe I didn’t – LOVING all the food and that desk is awesome! I should get one because I sit too long during the day for work, too, and I think that’s why I have Sciatica issues on occasion. I was worried about adjusting to the standing desk, but it hasn’t been a problem at all. Wish I could get one at work now! I seriously need something at work! OMG! Today my heel started bothering me and not even on my sciatica side! Grrrr!